Hundreds of UK companies have yet to publish their gender pay figures before Thursday's midnight deadline. The Equality and Human Rights Commission (EHRC) said it would take enforcement action against all firms that missed the deadline. The median pay gap among companies that have so far reported is 9.7%, flat against last year. Big firms with the largest gaps include Easyjet, Lloyds Bank, Clydesdale Bank and British Gas, BBC analysis found. The BBC looked at companies' median pay gaps. Of businesses with more than 5,000 employees, some with the biggest increase in the pay gap compared with last year include Kwik Fit and Interserve FS. The median pay gap is not the same as paying women less than men to do the same work, which is illegal in the UK. But using the median pay measure is helpful in understanding the number of women in companies who hold senior roles. More than 9,500 private sector employers have reported their figures ahead of the deadline, leaving some 500 still to do so. The EHRC has vowed to act against companies that do not comply. Chief executive Rebecca Hilsenrath said: "Gender pay gap reporting is not optional. It is a legal requirement and there's simply no excuse for employers failing to comply with the regulations this year. "We will be taking enforcement action against all organisations that have not filed by the deadline requiring them to report immediately. "Employers that don't report on time not only risk enforcement action and potential financial penalties; they are letting down the women who work for them. They should be prepared for an unhappy workforce and potential reputational damage." 8% report no pay gap. By law, companies, charities and public sector departments of 250 employees or more must publish their gender pay gap figures. The first set were based on a snapshot taken in April 2017, and the most recent data relates to April 2018. Public sector firms had to report by 30 March, and charitable and private firms by 5 April. The BBC's analysis looked at private sector firms which had gender pay gap data and a consistent registration at Companies House for April 2017 and April 2018. At the garage chain Kwik Fit, the previous year's pay gap of 15.2% had favoured women, indicating that there were a high number in senior roles. But the latest data shows a reversal, with a 14% gap in favour of men. A company spokeswoman said the industry had been "historically more appealing to men", although it was trying to recruit more women. "We are keen to both promote from within the company as well as recruit more women to help redress this balance," the spokeswoman said. The gap at Interserve FS, part of the Interserve Group, widened from 0.6% to 14.9%. Interserve FS is one of 21 entities that make up the outsourcing giant. Countrywide Surveyors had the largest gap of the available reported data at 60.6%. The firm had not responded to a request for comment at the time of writing. Easyjet had a pay gap of 47.9%. The firm said in March that the gap had widened from 45.5% as more female cabin crew had been recruited since the last pay snapshot. Low-cost airline Jet2 had a 41.9% pay gap, compared with 49.7%. Although still a wide gap, it was also one of the businesses to have made the biggest strides in closing the division. UPS, New Look, Capita and EE also narrowed the gap. Barclays Investment Bank had a large pay gap of 44.1%. In its 2018 gender pay gap report, Barclays said it would introduce an "accelerator programme" for promising mid-level employees and try to recruit more female managing directors. It also said it would try to understand why women left Barclays. The pay gap at Lloyds Bank was 41.7%, while the gap at Lloyds Banking Group as a whole was flat at 32.8%. A spokesperson for the bank group said it was "committed to attracting and retaining the best talent," adding that "there is still more work to do". "We were the first FTSE 100 organisation to make a public commitment to having 40% of senior roles filled by women by 2020, and remain committed to both our gender target and closing the pay gap," the spokesperson added. While airlines and banks, including RBS, dominated the list of firms with the largest pay gaps, other businesses were in the top 10. British Gas, for example, had a pay gap of 37.5%. British Gas-owner Centrica said: "Our gender pay gap is not due to unequal pay. 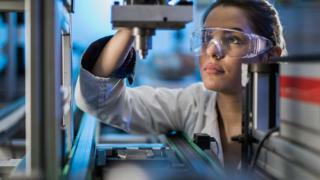 It is driven by a greater proportion of men in traditionally male-dominated and higher-paid technical roles, such as gas and electrical engineering." The Fawcett Society, a charity which campaigns for gender equality, called for tougher regulations to close the gender pay gap. "It is disappointing, but not surprising, that there are so many employers in the UK with large pay gaps and that these pay gaps aren't being closed," said Sam Smethers, Fawcett Society chief executive. "The regulations are not tough enough. It's time for action plans not excuses." She added: "Government needs to require employers to publish action plans that we can hold them accountable to, with meaningful sanctions in place for those who do not comply." Carolyn Fairbairn, director-general of the CBI employers' group, said: "The business case for equality is watertight and gender pay reporting must act as a catalyst for change. "Some of the practical action companies are taking - like setting themselves stretching targets - are having an immediate and positive impact. Other important steps like helping more women enter male-dominated sectors will make pay gaps bigger in the short term." The data submitted each year is based on figures drawn from a specific date - called the 'snapshot date' - the previous year. 5 April is the snapshot date for businesses and charities. 31 March is the snapshot date for public sector organisations.